Well here i am back on board after the wedding and a very nice time spent with all the grandchildren. I stayed longer than intended as one of the downsides of a life afloat is not being able to see the changes in the little ones as they grow up so perhaps a few more visits might be on the cards in future and with this in mind i will be changing my intended cruising plans. Me and Jo, maybe i`ll wear the waistcoat while cruising. Daughters- in -law Bev, Jo and Ozlem, i couldn`t wish for a nicer trio. Just to let you all know NB Valerie is having a holiday in a Marina while i travel back down south on the train to attend the wedding of my son Kev. Might blog something while i`m away if not see you on my return. Just been lazing about the last week or so as i will be leaving the boat soon to go down south on the train as one of my boys is getting married. So it`s been a very slow journey spending a few days here and there moored up. gives access to plenty of shops and walking around town i noticed the Somerfield s/mkt is now a Co-Op, the one at Middlewich has been taken over by Tesco and as i`m sure they still advertise on TV they haven`t ceased trading. Anyone know the reason? Nb valerie dropping down through the bottom lock outside the Star Inn. The restaurant one side and the pub the other attracted big crowds over the w`end i was moored just below the lock so boaters had to very professional in front of a large audience. I came down the flight early to avoid the heat so my skills were not on show. Don`t remember this seat here on previous visits and as there is nothing to explain what it`s all about i can only guess the ceramic tiles were down by local schools. The pedestrianised high street had not only the general market but also a farmers mkt and the following day an Italian theme made for a busy w`end. Just along from my mooring these over 55s flats caught my eye as the block on the left and those out of sight to the right were modern looking compared to the two in the middle and me being me had to find the answer. Good old Google came up trumps and eventually i found links to the picture below. The pic was taken in 1989 and shows the buildings of Stubbs & Co. corn merchants & millers with the arched entrance for loading boats still in the pic above. The timber extension was demolished when the site was developed. 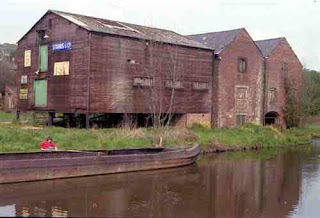 Talking of Google, on the Stoke on Trent blog the second to last picture i discovered used to look like the pic below. 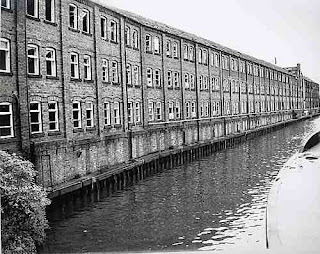 The bricked up openings just above the canal were used to load pottery products directly onto boats for shipping to London or Manchester and onwards across the globe. I just love the Internet one big electronic history book, imagine in the past looking at book after book in a library to find the answers to what is now just a few key presses on a pc with the ability to share the books pictures and info to the world instantly. Now the history behind the picture below is that Eric and Patsy e mailed me many moons ago after reading the blog as they had the intention of a life afloat following a long period touring the USA in an RV. After about 200 e mails, well ok a lot of e mails over a long time, they finally set off on the maiden voyage and we met at Barlaston. A smashing couple of people and i look forward to us all meeting again sometime along the cut but until then happy cruising on NB Ezzyduzzit. Think that's the spelling. The only thing about coming off the Maccie canal is that after passing through Harecastle Tunnel and spending a very pleasant night moored alongside Westport Lake the depressing journey through Stoke on Trent is ahead. All the way through old factory's and Kilns that once made Stoke the china capital of England but now they stand dirty and empty providing homes for the local pigeons and in one case a group of travellers and their caravans. Just a few of the hundreds of chimneys still stand to attention the remains of a defeated army. Small canal arms that once were busy with working boats fetching coal to feed the furnaces and taking away china products that would end up all over the world. Above all that`s left of the Etruria factory built by Josiah Wedgwood in 1769 now home to a local newspaper and below what it looked like in 1936. 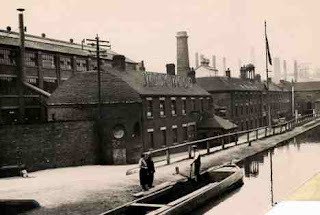 In 1940 the factory moved to Barlaston and a station was built and named Wedgwood to serve the factory. Now even the trains just rush through having been replaced by a bus service. In 1986 Waterford Glass bought out Wedgwood and early this year Wedgwood went into administration and some fancy investment company is to pump in 100 million euros and move production to Asia. A Wedgwood factory in Indonesia already employs 1,500 so another nail in the coffin of British manufacturing. Wedgwood founded in 1759 was 250 yrs old this year and i bet poor old Josiah Wedgwood is shuddering in his grave as these events take place. At least below the Bone & Flint mill built in 1857 still stands and is part of an industrial museum. It used to grind Bone, Flint & Stone for the pottery industry and the steam powered machinery can be seen on specific days working. and further on signs of the present in the form of graffiti. I came across an interesting article in one of the online national newspapers "Why i weep for Wedgwood" by a Mr A N Wilson who`s father was Managing Director of Wedgwood in the 1950`s. It`s a bit long but is very interesting, " Stoke on Trent had never been a pretty place but it was thriving and it had a purpose" is one quote from the article another is "it is now a wasteland and a dump"
Give it a read HERE it is very interesting.